You can do it, nonprofits! Organize your own run and be successful. Below is an article about how the J P Cain Stadium did it. Runners around J.P. Cain Stadium had a Pi-dye party Saturday afternoon in Hartselle all while helping support Hartselle’s football program. 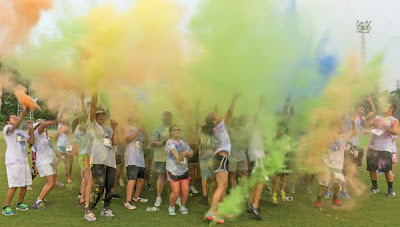 The Hartselle High School Quarterback Club’s annual J.P. Cain Stadium Run (or Dye) gave runners a chance to change colors along the way, as event volunteers sprayed dyes along the 3.14 km route. Scott Shelton, volunteer with the club, said the dye run, which was new this year, was a hit. Will the Colored Cornstarch Powder Stain My Clothes and Hair? How Much Colored Cornstarch Powder Should I Order for a 5K Event? Squeeze Bottles to the Rescue! Color My Party™. Awesome Inc. theme. Powered by Blogger.